Would you like to see your face on a $100,000 bill? 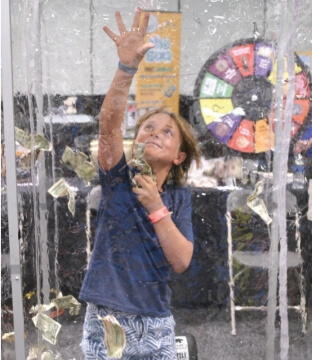 You can do that and more in the Kids Zone at the World's Fair of Money. With the help of ANA staff and convention volunteers, you can play the “Estimation Station” game and discover some surprising items that have been used as money; trace the origin of a world coin and take it home to start a collection; put your imagination to work as you design your own coin or note; and cast a vote for your favorite president. Visit The Elongated Collectors to “squish” a special coin. Families and children learn about numismatics as they explore the bourse floor in search of answers to trivia questions. The free game is scheduled during public show hours, Tuesday-Saturday, August 14-18. Stop by the Kids Zone for information about the Ancient Coin Project, Early American Copper Coin Project, “Coins for A’s” and other ANA programs for young collectors. Find additional resources on the ANA website, www.money.org.